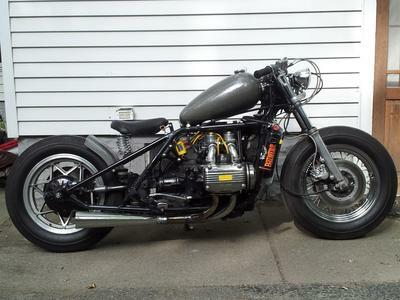 I chopped and bobbed my 1975 GL 1000 Honda Goldwing. Modifications include: hardtail rear frame section, 16" balloon tires, modified frame backbone, mustang fuel tank, K&N air filter, custom made exhaust. 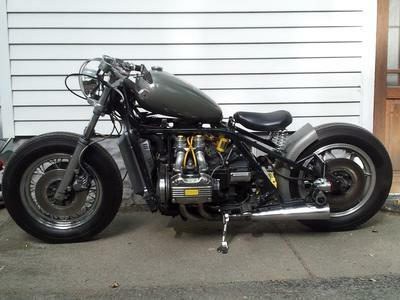 I first got my 1975 Honda Goldwing back in 1993. it was completely disassembled, in grocery bags and bushel baskets. I rebuild a motor put the bike back together and rode it stock for several years. When my kids were young I put a sidecar on it and eventually took it back to it's stock form. Earlier this year I decided to chop it, make it a real barebones Chopper. I started by cutting off the entire tail section and removing wiring harness. I took off the dummy tank and had to fabricate a backbone to support the Mustang gas tank that is on it now. I kept the wheelbase stock and had to fabricate a bracket to support the final drive. I wanted fat tires on it so I laced up a 16 inch Harley rim to the stock front hub and I used a Henry Abe mag wheel for the rear. I made some clip on handlebars for it and dual headlight brackets using some old Harley Sportster parts. 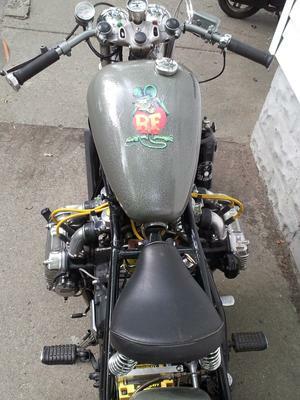 The paint is Hammerite gray with a urethane clear coat over it and the Rat Fink on the tank is in nod to Indian Larry, one of my favorite builders. Nice and massive. I like it. I like it veeeeeeeeeeeery much.